Leading Manufacturer of cof skid resistance tester from Delhi. The apparatus is suitable for both site and laboratory applications to perform two types of tests:- For measuring pavement (road asphalt) surface frictional and skid resistance properties. 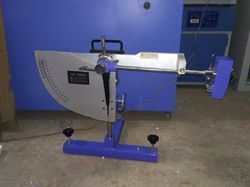 - For polished stone value tests on aggregates (curved specimens) from accelerated polishing tests.